Last month we brought you news of a mysterious Asus device that leaked and appeared on Antutu benchmarks. 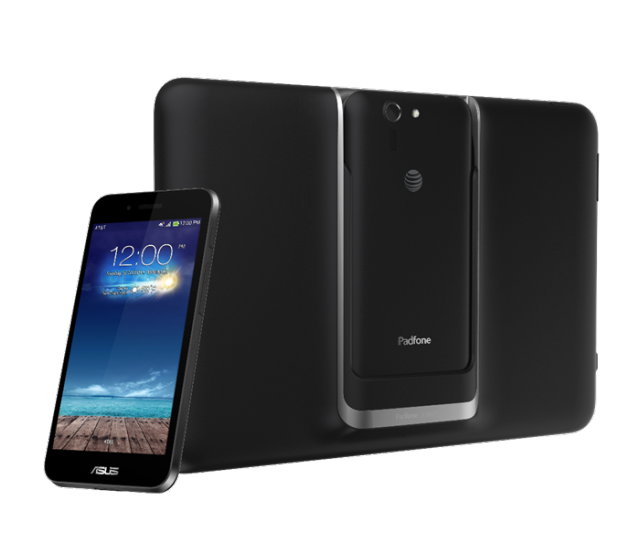 That device, then rumoured to be the Asus Padfone X, is now official. Confirmed by Asus alongside its many other CES announcements, the Padfone X is exactly what we expected spec-wise but won’t be going to every market as previously thought. It is an AT&T exclusive. Asus barely revealed the specs of the upcoming device but it won’t be further from what was revealed in the leaks late last year. A 5 inch full HD display. Since the Padfone is actually a smartphone that docks into a tablet, the tablet will have a 9 inch display and the phone will dock at the back for charging using the tablet’s large capacity battery and displaying the phone’s apps on the extended tablet display. NFC (to support AT&T’s mobile payment system, Isis Mobile Wallet. Interestingly, Asus not only released the Padfone X but there’s also a mini version of the monstrous Padfones, the Padfone mini which will also accompany the Padfone X in the US market at a cost of $249 with slight modification to its spec sheet which we first saw when the Padfone mini first came to light last year.